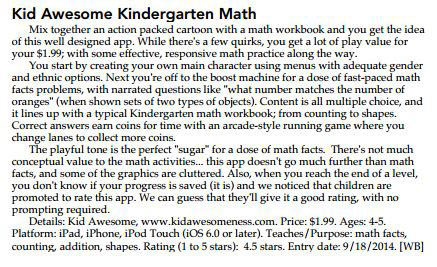 Kid Awesome Kindergarten is an outstanding app. Developers have incorporated features that not only make it easy for young children to use, but that also will really motivate them to come back again and again. The high quality graphics rival many video games, and the music is exceptionally motivational, as it mimics the theme songs of the super hero genre of cartoon shows. The visual directions for children are easy to understand, and the activities move at a lightning pace that is sure to capture and keep nearly any child’s attention.